Health Coach » Healthy? Donut? What the…!?! Hey, hey, in celebration of National Donut Day on June 1st, we decided to keep you in the loop (get it? ;) with a healthy (um, yes, healthy!) donut recipe that is gluten-free, vegan and CHOCOLATEY deluxe! 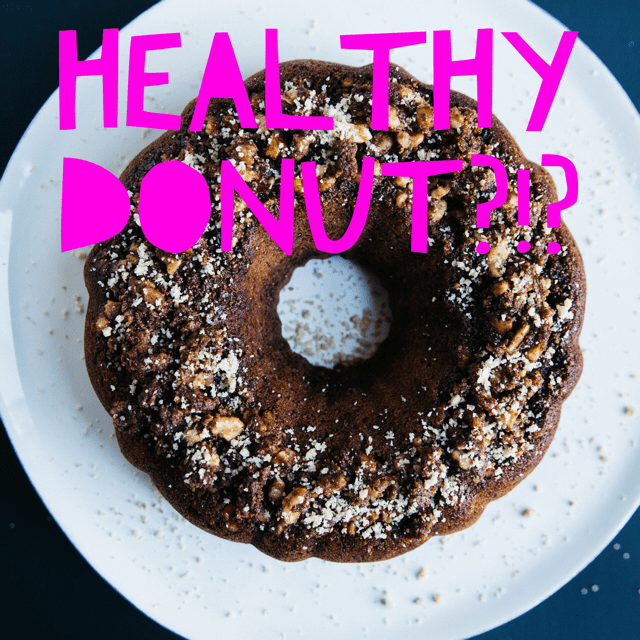 Just because you’re a health nut, does not mean you have to altogether forgo your donut cravings, now does it? Here’s to having your donut and eating it too! Goodbye trans fat laden, greasy donuts and hello donuts that’ll feel good in your belly and to your mind. Yum! To a large mixing bowl, add the melted coconut oil. Then add the coconut sugar, maple syrup, vanilla extract, and sea salt and whisk vigorously to combine – about 45 seconds. Then add applesauce and warmed almond milk and whisk once more to combine. Remove donuts from oven and let cool for 1-2 minutes. Then grab the tins with a towel and tap on the counter 2 times to loosen. Then gently invert onto a cooling rack. Let cool for 5 minutes (the longer they cool, the more they’ll firm up). *Aquafaba is the “egg” in this recipe. Alternatively, you can try subbing 1 1/2 flax eggs (or 1 small egg if not vegan). *I’ve been preferring almond flour over almond meal because it yields a lighter, fluffier (less dense) baked good. But you can try subbing almond meal. Or, if you have a nut allergy, try subbing a 1/2 +1/2 mix of GF flour and oat flour. *If not gluten-free, sub the GF blend for all-purpose flour. I haven’t tested it this way and can’t guarantee the results. *If you don’t have donut pans, you can try baking these in a standard muffin tin! Fill slightly more than 1/2 full and bake for about the same amount of time or until a toothpick in the center comes out clean. *Nutrition information is a rough estimate for 1 of 12 donuts without the glaze. Eat Mother Nature's Rainbow Colors!